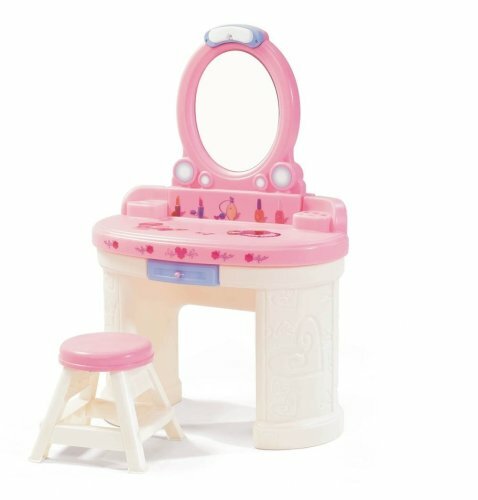 Give your little girl some extra glamour with this kid-sized Fantasy Vanity from Step2. Your little make-up or hair artist can get ready using the shatterproof, plastic mirror that's safe and functional. Vanity features molded-in storage compartments to hold make-up and accessories, and the working light automatically turns off after 5 minutes. There's also a pull-out drawer in the desk for organizing beauty supplies. The Step2 Fantasy Vanity comes with a three-piece accessory set, including a hand mirror, brush and comb. Beauty supplies sold separately. Its poly construction will last for years to come and wipes clean easily. Minimal assembly required. Requires 4 'AAA' batteries (not included).